One of the ways I judge the quality of our lives is by how often we eat steak dinners. It may sound silly to some, but a good steak dinner matters to us, and it’s a good indicator of both economic prosperity and availability of time. And it’s not just having steak, but also the quality of the cut we could afford to buy varied over time. When we were young and poor, steak dinner was something we treated ourselves to once a month and we got whatever was on sale. As the kids got older we would have it maybe twice a month, and Top Sirloin was our meat of choice. Later we could all have New York strip steak twice a month and that felt luxurious. But at the height of our financial prosperity we all had big, fat ribeyes once a week. Even when I was traveling a ton, we would have our ridiculously huge Ribeyes on either the Saturday or Sunday night I was home. Steak dinner always mattered, and not just as a good meal, but as a symbol we were doing well. When we started out on the road we continued the tradition, but with the price of steak (and quality) being highly variable we eventually dropped down to twice a week. 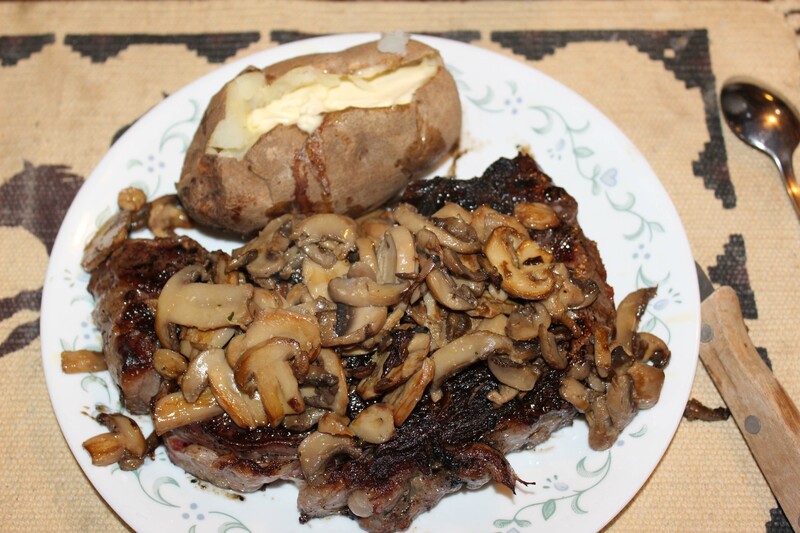 Decent, reasonably priced ribeye is one of the main reasons we got our Costco membership as the price is always $10.99 or below and the cut and quality of the steaks is generally very good. (I think they’re just acceptable. They are consistent, but I wouldn’t call them VERY good. – Lee) As we struggled to get the food budget under control we did discuss going back to a cheaper cut of meat, but Lee vetoed that idea pretty quickly. Less steak he was OK with, but lesser quality not so much. We rarely had steak in Alaska. Partly because once when we made our monthly Costco trip they were totally out of ribeye and partly because we had some special fresh fish dinners that somewhat took it’s place. Also, since they don’t raise cows in Alaska the meat was not that great, and definitely on the expensive side. During the beet harvest I think we only had steak one time. We were too tired, and oddly not hungry enough to mess with it after a twelve hour day and only on one of our early off days do I remember Lee fixing us a steak. And now we are selling Christmas trees and once again steak has not been something we have cooked. We are stocked up with some great Texas beef, but now we have no time. One of us always has to be on register all of the time, so unless we want to eat steak prior to 11am, after 9pm, or separately, it can’t happen. And I miss it. I miss not just the steak dinners, but having dinner together. Currently our meal schedule is roughly (for me) lunch 12:15 and then dinner around 5:30pm. These are some of our slowest periods, because most people are eating during this time. Not slow enough for us to both take a break, but slow enough for Lee to handle it with one employee. Lee is eating lunch around 2pm and then dinner at 8:30pm. It’s late, but he would rather wait until late than be interrupted during his meal which kept happening when he was eating earlier as invariably some situation would arise that I needed his help for. I’ve tried to cook some meals and then he reheats them after 8:30pm, but my breaks are sometimes very short and I have been relying on a lot of peanut butter and jelly and soup to get me through. That kind of diet wears on you after awhile though, and I am seriously craving something hot and filling to eat. So, I asked Lee if he would be OK with cooking the steaks, eating an early dinner, and then I would heat mine up a little later. Since it’s been slow during the week, maybe we can make this work, and if not..well, at least we tried. It’s been over a month since we last had any steak and it’s either that or splurging on take-out. Since we are really trying to control our spending, steak at home is the much better choice. We decided to go for it on Wednesday since Tuesday was our slowest day ever (only sold 5 trees and they were all little ones). This required some coordination as we needed something to go with the steak so Lee had to run to the HEB grocery store down the road. Normally he tries to go before we open at 11am, but occasionally he can’t get out the door in time and goes right when we open in the morning. This morning we ran into that and he decided to wait until we opened. Mainly because if our one employee was late, I would be alone and I can’t lift trees into cars. Almost everyday (even yesterday with only 4 tree sales) we have a customer right at the gate at 11am, so it is best we are both here. And sure enough, our employee who is never late had a problem with the steering wheel column being locked on his car and was late. Which proves the point that even though in theory we could leave, we can’t in good conscience leave. Why am I going into all this detail about steak? Well it goes to quality of life. We have had some in-depth conversations as of late as to how to account for the hours we work in our final analysis of what we are being paid. You could make the case that on slow days when we are not processing trees or helping a customer we are off. You could certainly make the point that any time one of us is in our rig while the other person covers the floor we are off. And we discussed that. I was definitely leaning in the direction of removing those hours (which would correspondingly raise our hourly wage), but Lee ultimately talked me out of it. He felt it was watering down the final results and what finally convinced me was the fact that I haven’t been able to get a pedicure. I know, weird right? But I have wanted to go with Cori to get a pedicure for over a month now and simply cannot leave the lot to do that. Whether I am actively working or not I have to be here, because we never know when the mini-rushes might come and since we can only have the minimum amount of employees my physical presence could be needed at any time. Even in my “downtime” I can’t really get into things because the phone rings quite a bit. Customers with questions, employees with schedule changes, or notifications from the owners or fellow Lot managers all come in throughout the day and need to be addressed. Thank heavens for the TV show the Voice. It has been the perfect show to watch, because I can walk away from it at any time and pick it up later when things slow down. Truly I think it’s fair to say I have not had a two hour block of uninterrupted time during business hours since we have been here. We also have not been able to spend hardly any time with our friends Cori and Greg. Since Thanksgiving they have stopped by twice and once we were getting a truck unexpectedly and another time we had several customers. It’s a bummer, because I thought the extra time with them would be a huge benefit to being in this area, but since we can’t leave to go to them and they never know how busy they will be when they come to us it just hasn’t happened. If we were the kind of people who could start hanging out after 9pm I suppose we could spend more time with them, but after a 10 plus hour day we just want to watch a little TV and go to bed. For all of those reasons we decided to count the actual work time prior to opening and the hours of operation since we opened plus an hours worth of work extra per day. That one hour is actually very generous, because many days start with a 8am text message, but overall it seemed the fairest way to handle it. So at this point on Wednesday 12/14/16, we have worked a combined 606 hours. Based on our base pay and commission earned to date we have made $7.63 per hour each. At least it’s above minimum wage. This obviously doesn’t include any future operational hours, future commission, or the bonus, so we really won’t know until the end how this all plays out. Also, it’s important to note that we are by far the slowest sales location. Everyone else has double or triple the tree sales that we have. It seems like the relative work is roughly the same as they have more employees to help them but process more tree, but maybe not. It’s quite possible that our workload is much lighter than those other locations. One thing that I think is constant for all of us though is the inability to leave the lot. Your life really is all about the trees during this job and there is minimal time for anything else. We did manage to have that steak dinner though. Lee really wanted to eat it together, so I had a late afternoon snack and we had dinner at 9:30pm. It was late, but pretty yummy, and we have tons of leftovers, which is always a good thing. It’s a shame that since it was our slowest day ever (3 trees, although one was a 8-1/2 flocked tree and we sold a couple hundred of dollars in extra along with the trees), that we couldn’t just take a break and eat at a regular time, but that’s the nature of the job. Oh, and just in case I am exaggerating the hours, I got a call at 8:30am Thursday morning with a request for an immediate inventory. When I asked if it could wait until we were open for business, I was told it really couldn’t wait that long. So my early morning was spent gathering and reporting the most recent inventory numbers. I agree with Lee, all the hours you have to “be there” count. Long ago with Dale’s art shows, when I calculated revenue and profit per hour, it’s always art show hours per day plus 2 (takes an hour to open and close the booth each day) plus initial set up and tear down hours. We have to be there, can’t really be productive with anything else. So even those shows that allow us to park the RV on site or nearby, all hours being open count. Like you said you can’t predict it so even slow times are still hours that aren’t free time. Looks like a meal for two.